Dental implants can do more than replace individual teeth — a few well-placed implants can support other restorations like a fixed bridge. The natural integration that occurs between the bone and the implant's titanium post creates a strong, durable hold for both implant and the supported restoration. But if a bone-implant connection weakens, the implant could be in danger of failing. This can occur because of periodontal (gum) disease caused by dental plaque, a thin film of built-up food particles and bacteria on the teeth. Untreated, the infection can ultimately spread from the gums to the bone and cause it to diminish in volume. If the bone loss occurs around an implant the threaded surface of the post may be exposed, inviting more plaque buildup. This can trigger more bone loss and eventually implant failure. That's why you must brush and floss daily to remove plaque on and around your fixed bridge just as you do your natural teeth. Brushing around a bridge could be difficult with a traditional brush, so you may want to use an interproximal brush designed for just such situations. Be sure any utensil you use contains only plastic parts — metal creates microscopic scratches in the restoration materials that could harbor plaque. You should also floss between the bridge and gums as well as between any natural teeth. While this can be difficult with traditional flossing methods, there are some tools to make it easier. One is a floss threader, a small tool with a loop on one end and a stiff plastic edge on the other. With floss threaded through the loop, you gently guide the edged end between the bridge and gums. Once it passes through, you wrap the two ends of the floss with your fingers as you would normally and work it along each side of the nearest implants. 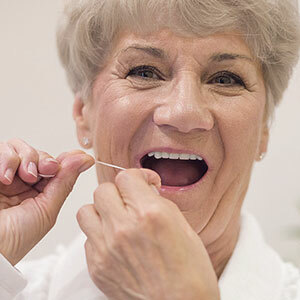 You can also use pre-cut floss sections with stiffened ends to pass through the gap, or an oral irrigator that loosens and flushes away plaque with a pressurized water stream. Just be sure you flush debris away from the gum and not toward it. Keeping all surfaces of your implant-supported bridgework clean of plaque is necessary for its longevity. Be sure you also visit your dentist regularly for more thorough cleanings. If you would like more information on oral hygiene with dental implants, please contact us or schedule an appointment for a consultation.